Everybody loves a baby keepsake! Stork Threads is an online boutique for every detail of baby’s coming home outfit. 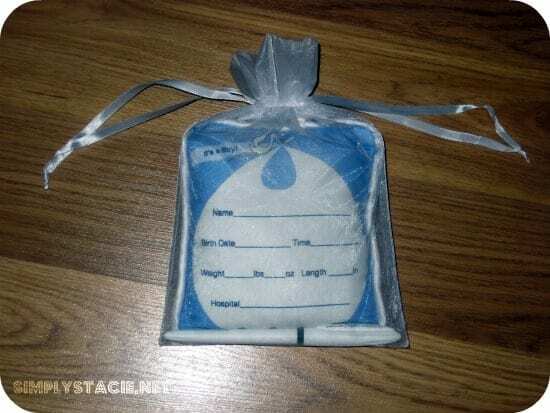 They offer a great keepsake for your new baby: an elegant door hanger pillow. It was created to be a great under-twenty-dollar gift, and also something special for Mom to keep for years to come. The pillow is a birth announcement, with room to write your baby’s name, birth date and time, weight, length and hospital name. It’s everything you’d include in a birth announcement – just on a little pillow. I wish I had this when I had my son; I would have proudly hung it up on my hospital door! Luckily, I can still fill it out now (I still remember all the details!) and hang it on his nursery door at home. The door hanger pillow comes in various (but gender-specific) patterns to cater to any style. They feature white satin ruffle trim and sheer organza or wire ribbon for door hanging. It comes with a waterproof, archival-quality pen and a transparent white gift bag, which is a nice touch. Stork Threads recommends using the pen that comes with the door hanger, as it was built specifically for this purpose. If you are looking for a trendy way to announce your baby’s arrival to hospital visitors, and you don’t mind the price, I think you’ll be very happy with this item. It’s something any Mom would want to keep for years to come! You can buy it directly from Stork Threads (U.S. only) for $18.50, or from Amazon for the same price. You can connect with Stork Threads on Facebook and Twitter. Rachel lives in Orlando with her husband and son. She is a WAHM (work-at-home-mom) and is active in her local mommy group. When she's not being a Mom, she enjoys gardening and scrapbooking. You can find her online at justsomemomstuff.com or twitter.com/rachelmarshall. I like the Organic Pink Butterfly Bodysuit for Newborn Girl. I love the Organic Forest Fun Baby Boy Blanket! I love the Dreaming Stripes Coming Home Outfit from Head to Toe! The Soy Soft Brown Blanket for Baby! I like the Organic No-Scratch Mittens. I love the Winter Paradise Top & Pant Set for Newborn Baby Girl. I love the Giraffe Pink Baby Girl Blanket! I love the Striped Newborn Baby Bib! i love the newborn baby rock and roll set! Rock and Roll coming home outfit! Love the Blue Guitar Long Sleeve Footie for Baby Boy! The Autumn Blossom Fleece baby blanket! I like the Rock and Roll Baby Boy Blanket! My favorite is the Giraffe Pink Top & Bloomer Set.